A few weeks ago, a friend brought this popcorn to our small group. She left some for us to munch after the group was over. I hadn’t tasted it, thinking it was just regular popcorn but then my son said something about how good the caramel corn tasted. Caramel corn? I wasted no time digging in once I realized it was a sweet treat. The kernels were lightly coated and not real sticky like other caramel corn I’ve tried. It almost tastes like kettle corn. 10 cups popcorn – I think that 12 or more is better, just a big popper full. When I used 10 cups, the kernels were too heavily coated. Boil everything but the popcorn in a saucepan. Pour over the popcorn and stir to coat. Put it out on a rimmed baking sheet (2 if you have them, because it’s a lot of popcorn) and bake at 300 degrees to crisp it. Stir it every few minutes, baking for about 10-15 min. total. Watch it so it doesn’t burn. Cool completely, or at least until you won’t burn your fingers and tongue. This looks really good! Did you use an air popper to make the popcorn? Oh my word….that looks fantastic! Popcorn + Caramel = this momma’s favorite! that’s great.. oooh you could add some nuts, seeds and dried fruit and have a GREAT homemade energy snack! 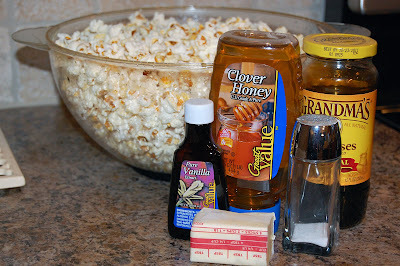 This is the first time I’ve seen a recipe for homemade caramel corn and it looks fantastic. I’m confused thought, did you just crisp up the corne kernals in the oven and then pop them in a popper? oh god…I would eat all of this myself…one sitting. Art Spectrum – I used a popper called Stir Crazy. It uses oil to do the popping. I really recommend that popper if you’re looking for a new one. Air popping or stove popping would work too though. Katherine – sorry to be confusing (I typed that up while fighting a migraine, so I have no doubt that I might not have been clear!) I popped the corn in the popper, then after stirring on the sauce, I crisped it in the oven. Sounds awesome- I’d probably add peanuts because I like to add extra fat and calories to every recipe I make! I think I’m going to make this today! Yummy Yum Yum I love caramel corn. I ad this since I was small! Looks so warm and cozy…. Yummy Tiffany that looks good. I havent made homemade caramel corn in a long time. I need to make a batch. I’m with Yaya on this one….Salivating! Oh, and I’m totally going to be try the poppy seed muffins too….The bread was really AWESOME! I want to reach through the computer screen to help myself to some of that caramel corn. don’t know if that will work though…. wow…I’m making this for our next family movie night, better make a dbl batch though!! 🙂 awesome! I’ve been craving carmel corn for 3 days and don’t know why. Maybe it was in anticipation of your post? We’ll be trying this for our movie night tomorrow! Thanks. That looks fantastic! 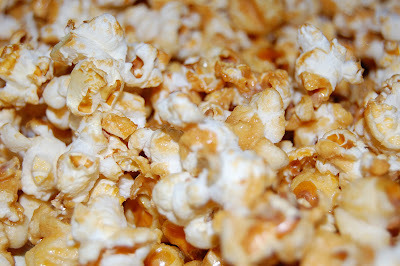 I love caramel and I love popcorn, so I know I’ll inhale this! I made this yesterday afternoon. It tasted a little burnt to me (just a tad – I’m sure I baked it too long) but it was gone in 20 minutes. There were 5 people eating it. They all said thank you very much to Tiffany. Wow this looks really good. And easy too! Thanks for dropping by my blog.